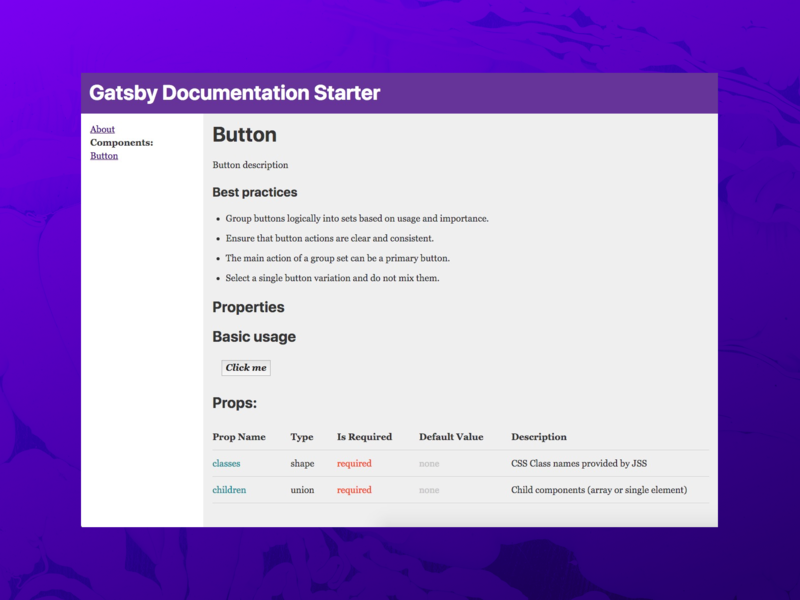 I recently was exploring different documentation solutions for design systems, and through my experimentation I created a template to create Gatsby documentation for any React project. Write your documentation inline with your components as docblocks, and add more in-depth descriptions + live examples using MDX. Check out the demo here. React-docgen grabs any JS Docblocks you write for your React classes/functions (Button.js), as well as the Prop Types. These are displayed on your documentation page, with the props organized in a table. Inside your MDX file you can write additional documentation with JSX examples (like React components!). You can also specify the page slug here (a page name and category). Your pages will be generated as http://yoursite.com/<category>/<pageName>. If you don't want to create MDX files and generate pages directly from components/JS files -- see the Github docs section: "Creating pages from react-docgen". The reason I chose MDX foremost is the flexibility of the frontmatter, allowing you to create different "sections" for components (if you have elements vs typography for example). Gatsby can get pretty complicated if you've never sat down and actually spun up a "Hello World" - and it can get even more complex when building a blog. If you're not familiar with how Gatsby works, check out their website for more info. It's basically a static-site generator that uses GraphQL during development to generate static pages from dynamic data sources (APIs, local files, etc). Gatsby pulls data into GraphQL, transforms the data (like parsing Markdown), then builds pages based off React components. Let's break each of those parts down. Gatsby works by using "source" plugins to aggregate data into GraphQL. This project is setup with gatsby-source-filesystem, which allows you to use the project's local filesystem (grabbing any file, from TXT to JS to MDX). This creates a GraphQL endpoint with all imported files. Each queried file, or GraphQL "node", contains auto-generated ID and a stringified version document body. Then Gatsby uses "transformer" plugins to create different GraphQL endpoints structured for specific datasets. If you query GraphQL for the data that the "source" plugin imported, you'd notice that it's pretty barebones. The transformer plugins do just that, transform the data into usable formats. For example, gatsby-transformer-json goes through each file, checks if it's JSON, then parses the body string back into an object/array. This template uses gatsby-mdx by @ChristopherBiscardi and gatsby-transformer-react-docgen by the Gatsby team. gatsby-mdx parses any MDX files and creates cached HTML+JS files that are imported into pages. gatsby-transformer-react-docgen uses react-docgen, a CLI tool created by the Facebook team to pull documentation from React components. It runs the CLI on any JS files you import and creates GraphQL endpoints for it. When Gatsby runs it's build process, it creates pages from any JS files we include inside the src/pages/ directory. During the build process, it also executes additional modules we add to gatsby-node.js. This allows us to do things like add new nodes to GraphQL endpoints, or create pages from GraphQL queries. For this template, I query GraphQL for all MDX files, and create pages from those. The pages are generated from a "template", which is a React component capable of running GraphQL queries. As Gatsby is a framework, it offers an API/methods for all these actions (querying GraphQL, creating pages from React components, passing data to the React components, etc). I wanted to keep the design and actual code pretty lightweight to make it easier to repurpose. The layout of the documentation is 2-column with a header, where the sidebar column disappears on mobile (and a "toggle sidebar" button appears in the header). The snazzy animated mobile button was pulled from Codepen by @ ainalem. This project is perfect for deploying on Netlify, since it's optimized for static-site generators like Gatsby. Once your fork your project, just import the Git repo into Netlify and it should handle the rest! What if I don't like Gatsby/JS/React/etc? And there are plenty more! Don't feel limited to one particular stack or setup. Find one that gels with your flow. I appreciate great tools that take your hard work slaving over docblocks and proptypes, and in a click of a button -- transform your codebase into a fully functioning and well-designed documentation site.